In my Bears mock Finale, I decided to add trades to the equation. Why not? We’re all just shooting in the dark anyway. I won’t bore you with a big intro so away we go. 8th overall pick: ***Bears trade*** With the 8th overall pick in the 2018 NFL draft the Chicago Bears trade their pick to Buffalo for their 12TH overall pick, as well as the 96th overall pick in the 3rd round, and the 166th pick in the 5th round. Yeah, that’s right, it’s my draft and I’ll trade if I want, trade if I want to. Ok, aside from having the opportunity to make a cool Leslie Gore parody I really feel Josh Rosen drops to the 8th spot. Lamar Jackson for sure will be there too. I’m not sure how serious the rumors about the Patriots looking to trade up for Tom Brady‘s successor is, but the noise is loud enough to get Buffalo nervous about the possibility of them jumping over them to get Rosen and anxious to make a deal. Buffalo needs a QB and Rosen at 8 is too good to pass on. Plus they get to keep their 22nd pick and get another player to help the team win now along with their future franchise Quarterback. The Bears get a 3rd back and a 5th which is a round that has some very good value. They fall just out of the top 10 in the first and still figure to get an impact defender. 12th Overall pick: With the 12th overall selection in the 2018 NFL draft the Chicago Bears select out of Boston College 6’3″ 255 lb. 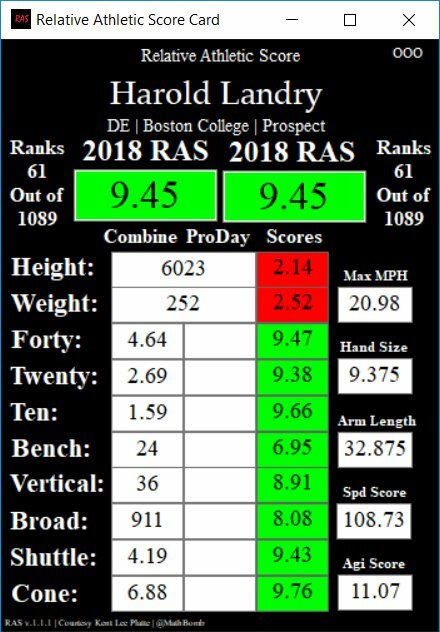 Defensive End/Outside Linebacker Harold Landry. The Bears trade back four spots and get a player they may very well have selected 8th overall anyway. In Landry, they get the best pass rusher in the draft. Period end of sentence. His production dropped off this season from last where he would have been in the discussion for number one overall pick if he had left college, but if not for an injury to his ankle he sustained in game 3 of the 2017 season, he’d have had another monster season. He was well on his way as he had 5 sacks in his first 5 games with countless disruptions. When healthy he is an elite athlete. As you’ll see from his relative athletic scorecard he grades high in every category said for height and weight and that’s only because he was being graded as a Defensive End the position he played in college. As an OLB on the Edge, he’s fine size wise. 39th Overall Pick: With the 39th overall pick in the second round of the NL draft the Chicago Bears select out of Colorado Cornerback Isaiah Oliver. Oliver has good size at 6′ 201 lbs. and is still growing. I could see him putting on another 10 pounds of muscle to his frame without losing any athleticism. He has very long arms at 33 1/2″ and big hands at 9 3/4″ that are strong yet soft to be able to haul in errant passes from opposing Quarterbacks. He’s a bump and run lockdown corner and will fit in well in Vic Fangio‘s secondary. The Bears have both started locked in for 2018 but he can easily play in Nickel and Dime packages until Prince Amukamara moves on or is eventually replaced on the depth chart by Oliver. He’s not a blazer but plenty fast enough running a 4.5 flat at the combine and also showed his quickness and suddenness posting a ridiculously fast short Shuttle time of 3.97 and very good 3-cone of 3.85 at his pro day. He’s also very cerebral with a high football IQ and character. With him, and Bryce Callahan inside and Amukamara and Kyle Fuller on the boundaries the Bears would be set at Cornerback for the foreseeable future. If the Bears found Gallup sitting there at 96th overall it should take them about 2 seconds to have a consensus agreement in the war room and turn in the card. Gallup is the second player in a row selected from the Rocky Mountain State from rival schools so the rivalry will continue on the practice field where both players should help develop one another’s games. Both are insanely competitive and extremely good players. Gallup has good size but plays even bigger than his 6’1″ 205 lb. frame. Not a speed merchant but like Oliver plenty fast enough running a 4.51 40 at the combine. Gallup is just a natural athlete. He lettered in Football, baseball, basketball, and track in high school. He is a good route runner with sharp cuts in and out of breaks. Very good hands and athletic in the air who can haul in back shoulder throws with ease. He’s very good after the catch and runs with fury. Gallup would be an instant favorite of his coaches, teammates and fans alike on a team that embraces a blue collar hard nosed football player such as Gallup. 105th overall pick: With the 105th overall pick in the 4th round of the 2018 NFL draft the Chicago Bears select Defensive Linemen out of Fort Hays State Nathan Shepherd. Shepherd is a well put together 6’4″ 315 lb. interior lineman with 32 3/8″ arms and 10 1/8″ hands who has been compared to Akiem Hicks as a football player. Imagine having two of those guys flanked to each side of Eddie Goldman. Well if my prediction comes true imagination won’t be necessary because you will see that every Sunday during the NFL season. Shepherd instantly challenges for the bulk of snaps at the opposite Defensive End slot from Hicks. Either he comes in and upgrades the spot or lights a fire so hot under the underachieving Jonathan Bullard or the overachieving Roy Robertson-Harris that they kill it at Defensive End and solidify their position as the primary starting Right Defensive End who gets the highest percentage of snaps on the team. Shepherd plays with heavy hands and has a jolting punch. Gets good pad level and out leverages his opponents routinely. Some people have him going as high as the 2nd round which would make this an excellent value pick. 115th overall pick: With the 115th overall pick in the 4th round of the 2018 NFL draft the Chicago Bears select Outside Linebacker out of Auburn Jeff Holland. In my mind, it’s befuddling that no one is talking about Jeff Holland as a top Edge prospect. In my mind, this is an incredible value pick this far into the draft with a player that was so productive among power 5 Edge Defenders. He’s got prototype Edge Defender size at 6’2″ 250 with 33 1/2″ arms and 10 1/2″ hands. His tape is so good and as I mentioned he was incredibly productive. My guess is his athleticism is in question as he posted a 4.79 40. However, he was a well-honored player in his conference making first team all SEC this past season. He picked up right where carl lawson left off. He plays with physicality and a high motor. Plays with violence and will jolt you as a tackler as evidenced by his 4 FF this past season. He could use a little more dedication in the weight room but is naturally strong especially in his lower half. Famous for his “sensei mud” celebration after every big play. 145th overall pick: With the 145th pick in the 5th round of the 2018 NFL draft the Chicago Bears select Offensive Tackle out of Humboldt State Alex Cappa. Cappa is a player that plays with both aggression as well as athleticism. He’s not a bad technician either. Many feel he’s a natural fit as a converted Guard at the next level in a zone scheme but I think he can stick at Right Tackle. However, Matt Nagy. Ryan Pace and Harry Heistand will decide where he’ll best at. He has the football IQ and the character to move around the line and has the versatility teams like the Bears value in their offensive lineman. At the very least that will serve his career well as and gives him a floor of valued swing linemen who can be a solid starter at either tackle or guard and maybe even sub in at center if need be. 166th overall pick: With the 166th pick in the 5th round of the 2018 NFL draft the Bears select Cornerback out of Stanford Quenton Meeks. Physically Meeks is everything most teams want in a Cornerback and fits like a glove in a Fangio secondary. He’s 6’1″ 209 lbs. His arms are not vines at 31 3/4″ but he has big strong hands to re-route Wide Receivers as well as haul in errant Quarterback throws. Meeks didn’t run the 40 at the combine but he did at his pro day and ran it well with a 4.49 time. Not a burner but plenty fast enough. He also had a phenominal 3-cone at 6.72 showing his quick twitch and slow area quickness. he also leaped well with a 39″ vertical and 10.6 broad jump. He’s a cerebral player with a good football character and a lot of confidence as he proclaimed he was the best Cornerback in the draft. Pretty high praise by someone who was projected to be a mid-round pick. 181st overall pick: With the 181st pick in the 6th round of the 2018 NFL draft the Chicago Bears select Wide Receiver out of Georgia Javon Wims. Wims is a big athletic Wide receiver who is an ex basketball player and it shows in his ball skills. He’s 6’3″ 215 and made some of the catches in college football this past season. he’s someone that would make a good arget downfield for Mitch Trubisky or along the sideline as he can contort his body while leaping in the air to haul in 50/50 balls with the best of them. Should be a back shoulder monster and a great red zone target. He has some work to do which is how you get abtalent like this in the 6th round but he comes with good football character and should work to get were he needs to go to be a productive member of the Bears future wide Receiver corp.
224th pick overall: With the 224th pick in the 7th round of the 2018 NFL draft the Bears select Running Back out of Fordham Chase Edmonds. Short but stout at 5’9″ 205 lbs. he was a high volume runner and held up well. One of the most productive backs in college football history. Runs with speed (4.55 40) and quickness (6.79 3-cone, 4.07 short shuttle) and can jump some with a 34″ vertical and a 10’4″ broad jump. His numbers are eye popping. That’s a bit of a concern as some believe all those carries and receptions might have taken a lot of tread off his tires, and he did struggle with an injury in his senior season, but at 224th overall he’s well worth the risk. Runs with excellent vision and balance and rarely gets squared up on a tackle making it easy for him to avoid monster hits. Fits in well with the Bears zone svheme as he reads his blocks well and plants his foot and hits the hole quickly and decively with a great burst through the line. He’salso an outstanding receiver out of the backfield and has high football character and IQ. Excellent value this late in the draft that gives the Bears one of the most diverse and dangerous Running Back corps in the league. ← 2018 NFL Draft Sleeper Spotlight: Emptying The Clip!